The electric motors used in industrial and commercial sectors are improving their performance, in order to comply to the regulation under the EU directive for eco-design. Next levels to reach in 2015 and 2017. – EFF3 – standard motor. – IE1 – standard efficiency motor. 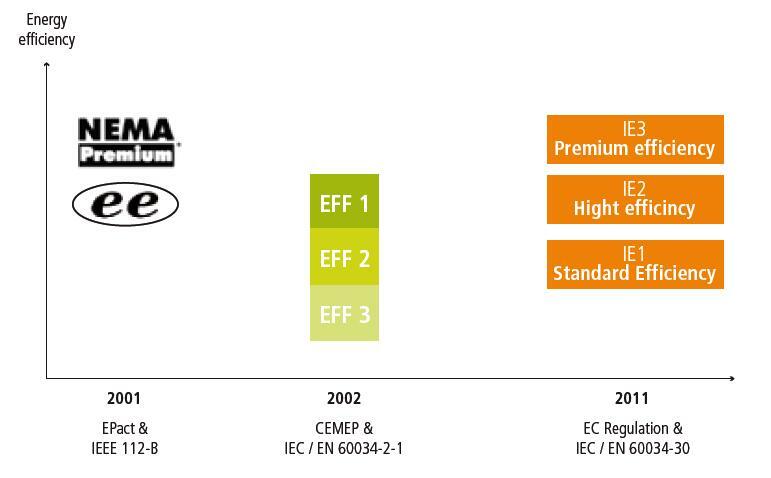 This classification replaces the efficiency classes EFF, NEMA / existing EPAct. It now covers three-phase motors, bipolar to 6-pole, from 0.75 to 375 kW and for maximum voltages of 1 000 V. First observation: the scope of the regulation is broader than before. Previously, only motors from 1.1 to 90 kW were concerned and for a nominal voltage up to 400V. Now, geared motors are included, but the servo motors remain excluded. Another advantage: the numerical sequence of these performance levels (this time logical!) will help to introduce in the future a class IE4 or IE5 even more demanding. Indeed, some manufacturers offering high performance motors begin to communicate informally about those future classes. Article 3 of Regulation 640/2009, implemented as part of the European Ecodesign Directive 2005/32/EC, imposes those classes according to a specific calendar. -From 1 January 2017 : all motors with a nominal power of between 0.75 and 375 kW must or have an efficiency greater than or equal to the IE3 efficiency level, or meet the IE2 efficiency level and being equipped with a variable speed drive. Overall objective for the European Commission: to reduce by 135 TW the electricity consumption in EU 27 by 2020. What technical and economic balance? This directive will result that their equipment will move up market. The Capiel (Coordinating committee of associations of manufacturers of industrial electrical equipment of the EU) considers that these requirements lead to an increased purchase cost of the motor. An overinvestment that should be compensated by energy savings obtained over the life of the motor. Thus, the cost of ownership of high efficiency motor on the whole life cycle should be much lower. Because on its lifetime, the cost of ownership of a motor is composed of the energy cost for more than 80%! (see Figure 2). Total cost of ownership of a motor on its entire lifecycle. 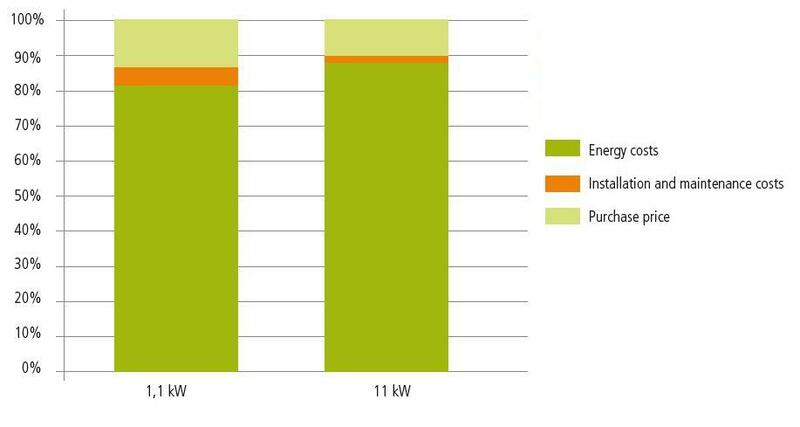 Example of two motors IE1 used 4000 h / year at a loading rate of 60% for 12 years for 1.1 kilowatts and 11 kilowatts for 15 years. However, the Capiel highlights a defect with the new regulation. Indeed, by only setting to products (phase asynchronous motors) a minimum energy efficiency performance, the text do not take into account other system components (speed, starter, gear …). Hence the need, as Capiel, of a more global approach, incorporating the motor into the complete drive system. or copy this trackback: http://engineering.electrical-equipment.org/energy-efficiency-motors/eco-design-of-electric-motors-two-more-steps-to-overcome-in-2015-and-2017.html/trackback from your own site. similar to this web page your site is individual of my new favorites.I like this website shown in addition to it has given me several sort of inspiration to have success for certain reason, so thanks. I really like that blog post..There are collection of amezing information about the electrical engineering..